We knew it was the Wright house as soon as we saw it. Those long horizontals hugging the earth, that flat roof and overhanging eaves, those clerestory windows high away from prying eyes . . . this was the place. And if we needed any further confirmation, the house was signed. There by the door was a red ceramic tile set into the wall, inscribed with the hand-scratched letters “FLLW”– for Frank Lloyd Lincoln Wright. Most people forget the “Lincoln,” which was his given middle name, but here he had inscribed it with his own hand, along with the other “L” for “Lloyd,” his mother’s maiden name. For $275 a night, providing we didn’t break anything, it was all ours. Inside, it had all the Wright stuff: the uncomfortable furniture, the wall niches for odd idols, the rugs and fabrics with geometric designs in earth colors. The floor was smooth concrete, marked off in large squares colored dark red, exactly as it should be. 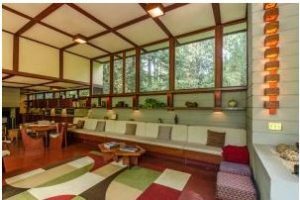 This was a Usonian House, one of nearly 500 built by Wright to prove that good design was not only pleasing to the eye and soul but economical and could be afforded by anyone wanting a home of their own. Of those 500, some 359 are still standing, either preserved in loving tribute to the architect or simply because they were well built. 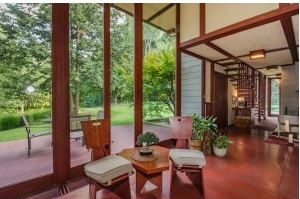 This particular Usonian house was built in 1955 for Louis Penfield, on a 30-acre wooded site along the Chagrin River in this eastern suburb of Cleveland. Penfield was an artist, and one day we took a short walk through the woods and discovered his studio, designed and built by Penfield, but now completely fallen into ruin. Even as a ruin it looked good. 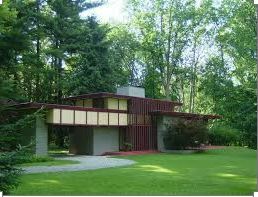 A peculiarity of Penfield greatly influenced the design of his house: He was 6 foot 8. “Anyone over six feet is a weed,” Wright said, he himself being around 5 foot 6, but he made some changes to accommodate Penfield. Floor to ceiling windows almost completely cover one wall, looking out onto woods and the river. The windows were made from tall slender panels, to echo its owner, Wright said. Deer stared in at us as we turned on the lights in the early dusk. Chipmunks paused in their race from one hidey-hole to another. They may have been an entertaining part of our view, but we were also part of theirs. The Penfield House doorways are also tall and slender, so slender in fact that anyone of more than normal girth has to go through them sideways. Handicapped access is out of the question. No wheelchair could navigate the place. The stairway to the second floor bedrooms and study has to be taken single-file and cautiously; there is no handrail and indeed no room for one. Tall and narrow describes the other doors as well; enter bathrooms sideways. Oddly enough, the closet doors are wide enough for a small car. The place is beautiful, both house and setting, but there are problems. The ultra-narrow doorways and halls were the first of them. There is a tendency among fans of Wright buildings to treat each one as a temple, a holy place in which the visitor should move slowly, absorbing art and sensing the nearness of the master. They come not merely to see but to touch the hem of the robe. Penfield must have had a lot of that feeling himself, since he changed almost nothing and filled many shelves with books on Wright’s works and philosophy. Replicas of Wright’s hat and cane, almost a signature with the architect, rest on a shelf over the couch, as if the master had simply forgotten them on his way out or perhaps was upstairs, out of sight for a moment. There is a well-equipped kitchen, including silverware and dishes, but breakfast or any other meal is up to the guests. Don’t forget to find a grocery store and go shopping before you arrive. Unless something unusual occurs, you will never see your hosts, Penfield’s heirs. The beds had the most uncomfortable mattresses we’ve ever felt, seemingly filled with coconut husks, maybe by Wright himself. They were made for an insomniac. Our solution was simple: create your own bed. We dragged up long cushions from the built-in Usonian couch downstairs and laid them on top of the mattress from hell. A little fiddling with the sheets to make things tight and we slept, huddled very close together. Thank heavens Wright liked built-in furniture with long cushions. Once upstairs, you can see the pools of standing water on the roof over the main part of the house. Flat roofs look nice, but one of the problems of course is that the rain doesn’t run off. Leaking roofs are a notorious feature of Wright buildings. Water doesn’t do the plywood walls any good, either. 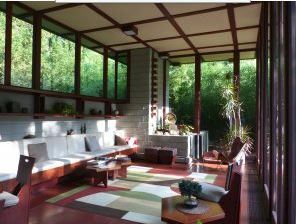 The house, like almost all Usonian houses, is constructed mainly of concrete block and plywood. Over time, moisture is absorbed and the plywood layers start to separate. Maybe marine plywood wasn’t available. Peeling paint becomes a design element. Entering and leaving can be a nuisance. 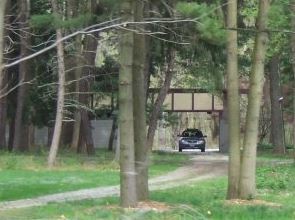 A kind of Wright- inspired steel gate closes the driveway off from the road. It’s nice looking, but the problem is it’s supposed to be always locked. After all, the house door lock doesn’t work well and is normally left open, so you should have some protection. You drive up to the gate, get out and unlock it with the key provided to guests, push it open, get back in the car, drive past the swing of the gate, get out of the car, go back and push the gate closed, get back in the car and drive to the house. Did you get all that? You do this whenever you enter or leave. With luck, it’s not raining. Weren’t automatic gate openers invented a few years ago? A note about the river back when: The Chagrin River is called that because Moses Cleaveland, an early settler and trapper, thought he was exploring on the nearby Cuyahoga River and about to discover Akron. When he realized he was actually paddling up another creek he was, well, chagrined. The river today: Some guests before us walked through the woods, down the path to the river’s edge and were swept away by a flash flood wave. They were rescued some distance downstream by the Willoughby Fire Department and a picture of it made all the local papers. They were chagrined. Would we do it again? Would we stay in the same house to experience the charm and beauty of the master’s hand and eye? Aye, there’s the rub, as someone once remarked. At $275 a night, this is not cheap. At least not for Willoughby Hills, Ohio. It’s a toss-up. It’s a nice place to visit, but a little creepy alone in the woods at night with nothing but a three-foot-high gate between you and any crazy who comes along. The Penfield House is in Willoughby Hills, Ohio, a suburb of Willoughby, itself a suburb of Cleveland. The price is $275 a night, with a minimum stay of two nights. A 50 percent deposit must be made at the time of reservation. Maximum occupancy is five people, no pets, no smoking. There is a $100 damage deposit. For information: 440-942-9996; www.penfieldhouse.com; e-mail penfieldhouse1@cs.com.